where \(\mu\) is the expected return of the financial asset, \(\mu_0\) is the risk-free return, and \(\sigma\) is the volatility. Assuming Gaussian returns, we can obtain time-varying estimates of \(\mu\) and \(\sigma\) with a simple Gaussian observation model with bayesloop, while \(\mu_0\) is just a series of given numbers we may obtain from the central bank. This tutorial shows how to evaluate arithmetic combinations of inferred parameter distributions after the model has been fitted, using the eval method of the Study class and the Parser class. 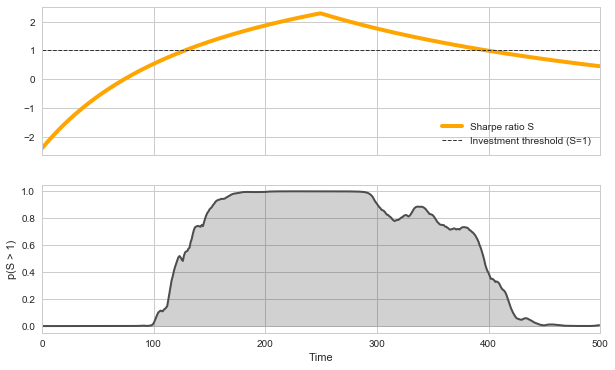 With these tools, we compute the probability that the time-varying Sharpe ratio of a simulated series of returns is greater than one (a common threshold for investing in financial assets). The evaluation of probability values is not restricted to a single time step, one may also be interested whether the expected return at t=100 is greater than at t=400. Note that bayesloop does not infer the joint parameter distribution of all time steps, but the conditional joint parameter distributions for each time step iteratively. This means that correlations between the parameter at different time steps are ignored by the eval method. Further note that comparing parameters at different time steps may result in a fairly long computation time and a lot of RAM usage, as bayesloop has to take into account all possible combinations of parameter values. Finally, we may plot the probability that our probabilistic, time-varying Sharpe ratio \(S\) is greater than one for each time step, together with the underlying true values of \(S\) in the simulation. We find that \(p(S > 1)\) attains a value of \(\approx 0.5\) at the times when \(S=1\) in the simulation, and increases further as \(S > 1\). Consequently, we find that \(p(S > 1) < 0.5\) for \(S < 1\) in the simulation. 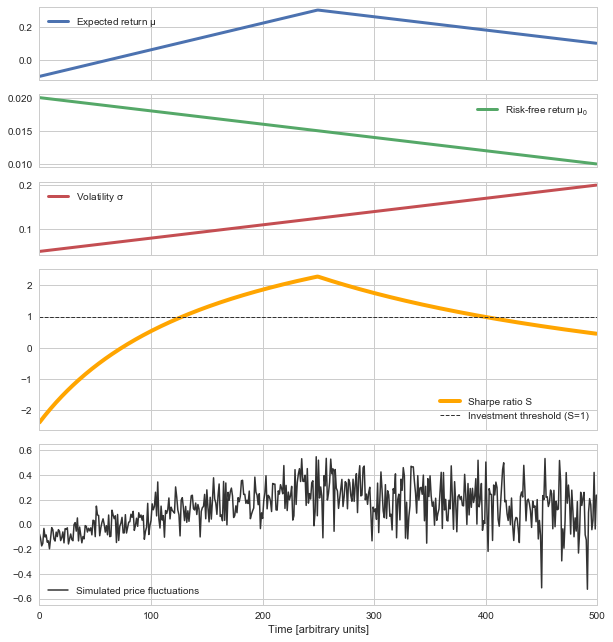 This example thereby illustrates how the combination of inferred time-varying parameters can help to create robust indicators for desicion making in the presence of uncertainty. So far, we have parsed either parameter names or plain numbers in the queries to the eval method or the Parser instance. In many applications, however, one also needs to compute the sqrt, or the cos of a parameter. bayesloop’s probability parser therefore allows to parse any function contained in the numpy module. Note, however, that only functions which preserve the shape of an input array will return valid results (e.g. using sum will not work). Note that the two studies S1 and S2 must not contain duplicate (hyper-)parameter names! This allows to create performance indicators that take into account different kinds of information (e.g. pricing data and social media activity). © Copyright 2016-2017, Christoph Mark. Revision cf9a0a2a.